Soccer fever has taken over as the FIFA World Cup is set to begin this Thursday, June 14th, agents and their players are counting the days for this massive event, and as expected the excitement has also taken hold of the staff at AcePerHead.com. This year’s world cup of soccer is different from those in the past, as many renowned teams like Italy, the Netherlands and even the US were left out of the competition. Instead of the more known teams, many “unknown” teams made the cut, but, because many don’t have much information about them, agents are concerned the level of interest might fall short of expectations. To help ease the minds of all concerned parties, we will be posting a series of articles analyzing the different teams comprising the eight groups that will battle it out in the first round of the World Cup. 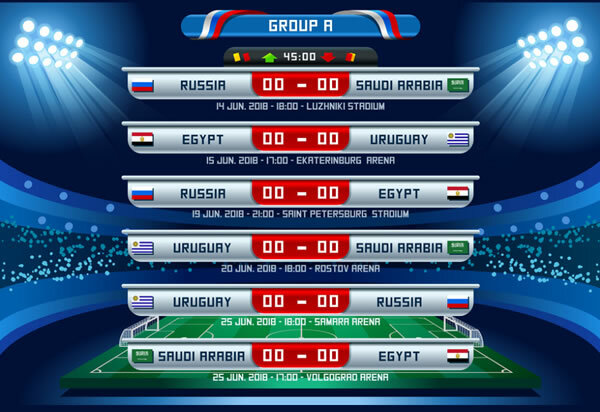 Group A includes the national teams of Russia, Saudi Arabia, Egypt, and Uruguay, there is a clear winner in this group, and that is Uruguay, Egypt and Russia will battle for the runner-up spot in this group to advance to the knockout stage. The lowest ranked team in the world cup, Russia is also the host of this year’s FIFA World Cup, so there is a lot of pressure on this team. While nobody expects the host to advance to the knockout stage, the team does have a decent goalie in Igor Akinfeev who is also the team’s captain. They face Saudi Arabia in the opening game of the tournament on June 14th. It would seem that Saudi Arabia is self-sabotaging, they fired coach Bert van Marwijk despite leading the team to their first World Cup since 2006, his replacement Edgardo Bauza was fired right before the draw. The team’s current coach Juan Antonio Pizzi who was appointed just a week ago and now has the impossible task of trying to make this a successful team; to do this he will undoubtedly rely on Mohammad Al-Sahlawi who is the reason the Saudi’s qualified, he scored 16 goals during the qualifying rounds. Egypt has not been in a World Cup since 1990, even though they have been strong contenders in the African Cup of Nations from 2012-2015, after which they lost their mojo and failed to qualify since. If they had been in any other group, I would have to say their chances of advancing were slim to none. However, they were lucky enough to land in group A which has the two lowest ranking teams in the tournament (Russia and Saudi Arabia), this means they have a fighting chance of advancing. They also have Mohamed Salah who plays with Liverpool, and he has proven he can perform under pressure after scoring five goals in 6 games in the final round of qualifiers. The only thing standing in their way to the knockout stage is Russia’s drive not to be humiliated. When the qualifiers started most people did not believe Uruguay would perform well, their well-known starts were beginning to lose their luster after all, but thankfully new players started shining. Only Brazil performed better than them in the South America qualifiers, and they are expected to reach the final 16 at least. They should have little resistance in the group stage, and should quickly establish themselves as the winners of group A. If you are looking for the sharpest soccer lines for the World Cup, look no further than www.AcePerHead.com.